Starting on Valentine’s Day 2014, give us your best public display of affection: simply share your story here and be handsomely rewarded! ★ X-server Charm: Valentine’s Day Edition – It’s Valentine's Day, and there’s no better time to give roses than now. On February 14th, climb the X-server Charm rankings and be rewarded with valuable gift packs containing roses and sweet fruit! ★ Intimacy Rewards – From February 13th - 15th, up your Intimacy by 300, 2000, 5000, 8000, 12000, or 20000 with partners and be rewarded with bonus gift packs. 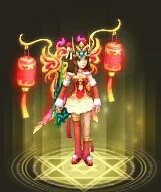 Packs include the recently introduced spring festival fashion items, superior purses, and various upgrade items. 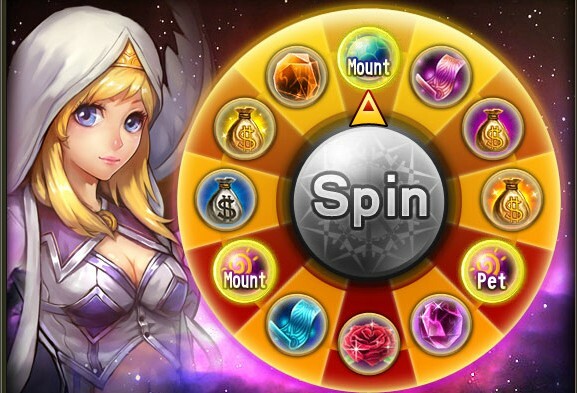 ★ Lucky Wheel - From February 13th - 15th, every 200 Gold you spend in the Shop gets you a spin of the Lucky Wheel. Each spin is a chance to win valuable prizes, including Mount Evolve Pills, Pet Skill Upgrade Pills, Mount Skill Upgrade Pills, and more! ★ It Pays to Consume - Spend Gold and get special bonuses! Click the “Timed Rewards” icon in the top-right corner of the screen for a full list of spending levels and rewards. ★ Rose Rush – Beginning with this update and lasting until the next maintenance, clear Demonhunt, Scimitar Valley, Molluscan Alcove, Elphame, Shadow Keep, and Demonsburg and collect Rose Essence. Rose Essence can be used in the Forge to synthesize Rose Petal Packs, Soul Shards, Dragon Shards, and Moon Essence! ★ Rose Discounts – 999 Rose Baskets are currently being sold at a 20% discount in the Clearance section of the Shop. Note to VIPs: This stacks with your current 20% discount! Each player may purchase up to 3 of these discounted baskets per day. This sale will last until the next maintenance. ★ Login Compensation – A number of players have reported issues recently logging into the game, especially from Indonesia. All players can head on over to the Gift Packs section of your Daily Benefits panel to claim your login compensation pack. This option expires on February 19th at 11:59 PM, so make sure to claim your pack before then. ★ Treasure Guards now appear more frequently when using Treasure Maps. ★ Items sold in the Clearance section of the Shop have changed back to the regularly listed items. Prices have also changed back to the regularly listed prices. ★ Gift packs from Divine Blessings have been changed back to Refine Stones. ★ Descriptions for items obtained from the X-server Honor Exchange now correctly describe the duration those items last for. Description: During the event time, top 30 players in the charm ranking list will gain rewards. Rewards sent out daily before the reset. Description: Love is in the air, and for the duration of this event, players who are married can receive bonus rewards by increasing their Intimacy level with their partner. Note: Rewards can be redeemed by clicking the “Intimacy Rewards” icon in the top-right corner of the screen. Description: For the duration of this event, players who spend certain amounts of Gold will get bonus clothing and accessories. Rewards can be redeemed by clicking the “Timed Rewards” icon in the top-right corner of the screen. Description: Clear Demonhunt, Scimitar Valley, Molluscan Alcove, Elphame, Shadow Keep, and Demonsburg to earn Roses . During the event time, these roses can be collected and used in the Forge to create Dragon Shards, Soul Shards, Moon Essence, and special Rose Packs. Note: Rose Packs contain Mid-lvl Purse x1 and Heart of Gratitude x1, a special buff. 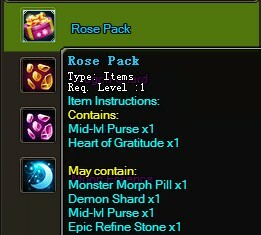 If you’re lucky, your Rose Pack may also contain another Mid-lvl Purse x1, Monster Morph Pill x1, Demon Shard x1, or Epic Refine Stone x1.